SolidCAM Inc., a world leader in advanced tool path generation technology (CAM) running directly inside SolidWorks, has released the update (HF1) of SolidCAM 2015 SP3. Empowered with the fastest Toolpaths in the business, SolidCAM is the best Manufacturing Suite for easiest, fastest, most efficient and profitable CNC-Programming done directly inside SolidWorks. SolidCAM has the Certified Gold-product status from SolidWorks since 2003 and provides seamless, single-window integration and full associativity to the SolidWorks design model. All machining operations are defined, calculated and verified, without leaving the SolidWorks window. 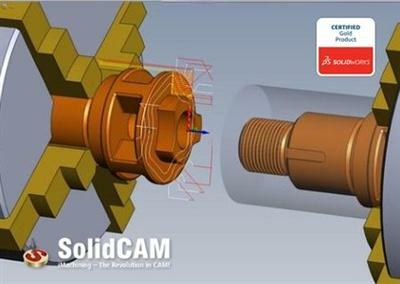 SolidCAM Inc. is a world leader in advanced tool path generation technology (CAM) running directly inside SolidWorks. SolidCAM features a full line of CNC machine programming software solutions ranging from 2 axis lathes and 3 axis mills to extremely complex multi-axis MillTurn machines and Wire Edm. All products run directly inside SolidWorks and provide the user with a true "SolidWorks look and feel" for ease of use and maximum efficiency. Along with the integrated interface and scalability for new machines, SolidCAM also has its patented "iMachining" that powers users to new levels of productivity and profits, through unmatched cycle time reduction and unrivaled tool life. Информация: Посетители, находящиеся в группе Гости, не могут оставлять комментарии в данной новости. Всегда оставайтесь в курсе последних событий, используя наш RSS-канал новостей.